In order to make the changes, the file explorer.exe located at C:\Windows needs to be edited. Since explorer.exe is a binary file it requires a special editor. For purposes of this article I have used Resource Hacker. 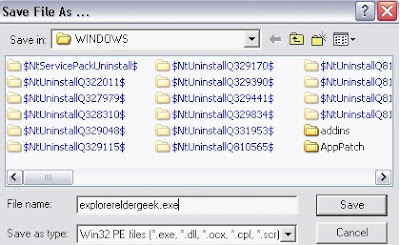 Resource HackerTM is a freeware utility to view, modify, rename, add, delete and extract resources in 32bit Windows executables and resource files (*.res). It incorporates an internal resource script compiler and decompiler and works on Win95, Win98, WinME, WinNT, Win2000 and WinXP operating systems. Navigate here to download Resource Hacker. The first step is to make a backup copy of the file explorer.exe located at C:\Windows\explorer. Place it in a folder somewhere on your hard drive where it will be safe. 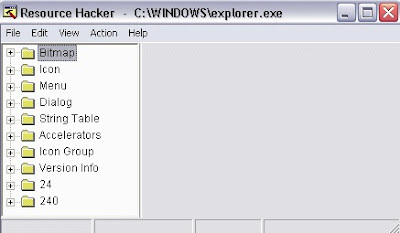 Start Resource Hacker and open explorer.exe located at C:\Windows\explorer.exe as shown in Fig. 01. The category we are going to be using is String Table. Expand it by clicking the plus sign then navigate down to and expand string 37 followed by highlighting 1033. If you are using the Classic Layout rather than the XP Layout, use number 38. The right hand pane will display the stringtable as shown in Fig. 02. We’re going to modify item 578, currently showing the word “start” just as it displays on the current Start button. There is no magic here. Just double click on the word “start” so that it’s highlighted, making sure the quotation marks are not part of the highlight. They need to remain in place, surrounding the new text that you’ll type. Go ahead and type your new entry. In my case I used ElderGeek as shown in Fig. 03. Compare the screen captures in Fig. 02 and Fig. 03 and you’ll notice that after the new text string has been entered the Compile Script button that was grayed out in Fig. 02 is now active in Fig. 03. I won’t get into what’s involved in compiling a script, but suffice it to say it’s going to make this exercise worthwhile. Click Compile Script and then save the altered file using the Save As command on the File Menu. Do not use the Save command – Make sure to use the Save As command and choose a name for the file. See Fig. 04. Save the newly named file to C:\Windows. In the right pane (Fig. 05), double click the Shell entry to open the Edit String dialog box as shown in Fig. 06. 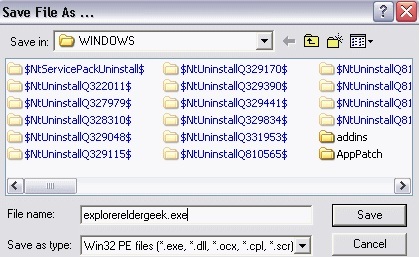 In Value data: line, enter the name that was used to save the modified explorer.exe file. Click OK.